all switch on interior panel are in tact and work. Im fairly new to how eagles work haha, but im guessing there is some kind of vaccum controled door that needs to open?? or perhaps thermostat? or heater core? but last time i had a heater core go out on a car it pooped green fluid everywhere.. any thoughts or suggestions would be very helpful thanks! There is a valve under the hood on the right side where the heater line goes into the firewall. It is vacuum actuated. See if that is moving when you turn the heat on. sometimes the core needs to have its air bleed out. maybe flush the core. or check that the thermostat is working with correctly heated water in a kettle (rambler mentality) also on the thermostat it needs to have the weep hole at 12 o clock. than check the blend door under the passenger footwell to insure itvis attached. If you don't have a 195 thermostat in there, you'll probably get little heat. They're pretty cold-blooded engines all things considered. The valve eaglefreek talked about freezes up all the time. Sometimes you can get them moving with some penetrating oil and some work. You can bypass it for the winter, Chrysler did it on later Cherokees. The metal valves usually run you about $60-$100, and the plastic Cherokee valves which may require a couple of reducer pieces to fit in since they're all 5/8 fittings are usually under $20. I've been leaning toward those, they may leak after 5 years or so, but they're cheap and available at any parts store. yeah my motor runs cool to begin with... according to my scetchy temp gauge its under 200f... Anyways just put a new thermostat in and no change. i have coolant in both hoses going to the heater core..
i am having trouble finding the valve you guys are talking about? Looks like the pic below. The heater lines come from the engine to the valve and then to the heater core. If yours does not have air conditioning, you will not have that valve as it was only equipped on A/C models. Then there's a good chance you're in for a little of it regardless of being the lazy or analytical type. Thankfully most of the problems with these old cars are vacuum and linkage related and very easy to fix or replace. The HVAC heater control valve is probably the most expensive part in the heating system and they're so old that they usually run for about $75. Mine is all rusted and I barely get heat out of my heater anymore so I'm probably going to take care of this before the next snow storm. 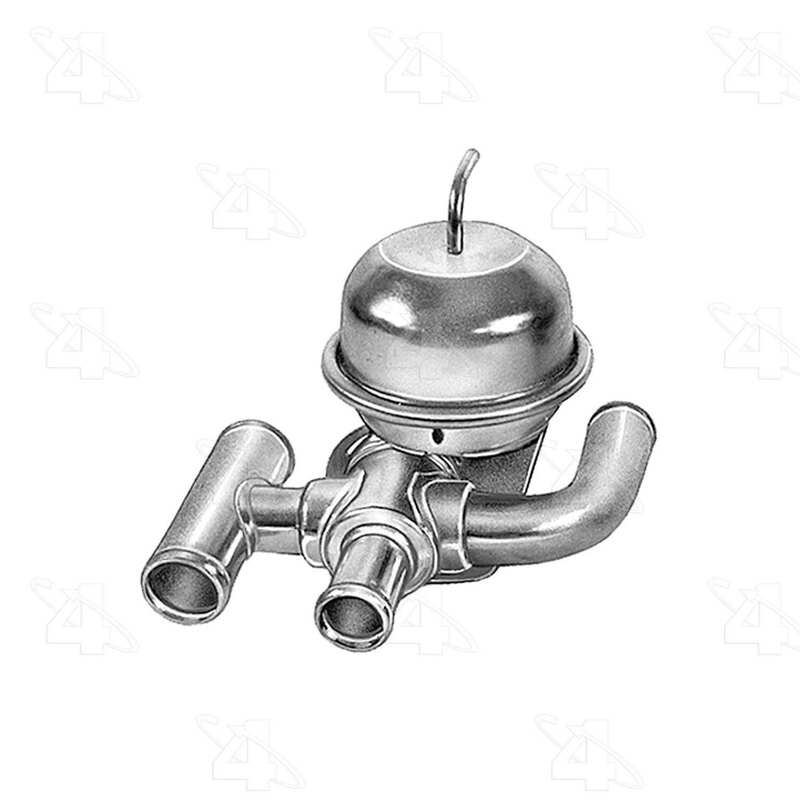 i do not have that valve.. since my car never had a/c i doubt i ever had that valve but non the less both heater hoses go straight to the core. again all my vent cables are hooked up and work. Is it possible that the core is clagged with crap and the coolant isnt actually flowing through it? Only way to find out is to flush the core. Your engine works, right? It gets warm, right? The coolant should be going through the heater core and you should be able to get heat from this system. I know the lack of that valve and A/C seems like it would complicate this but it's actually very simple. All 3 of my grandfather's old Fords show a very similar design. The fact that getting heat is a problem kinda worries me. Do both hoses going to the core get warm hot after the car warms up? careful not to push the hose on tootight as 30+ lbs is more than the core was designed for and it'll look like an exploded accordion! Use to work with a guy who's old Ford pickup would stop putting out heat every so often. When it did he would switch the hoses around and have heat again. It's the cheap/easy/lazy mans way to go. Might sound silly but you might try switching the hoses around on the heater core (or engine side). Keep in mind that they might be different sizes, so you will have to contend with that. This will amount to flushing the core to some extent and is a cheap/quick thing to try. Yes, don't get aggressive with it. More food for thought: as a young kid I didn't have much money. Had a friend flush my heater core as it wasn't given up any heat. It was flushing well but still no heat, so I gave him the green light to keep cranking up the pressure. Thinking was that a no heat situation didn't do me any good no matter how mush flow the flush machine showed. After we blew the core I went in to finally replace it only to find the heater box filled with a mouse nest. No air could move across the core. Lesson learned to check everything before blowing up a perfectly good part. From a guy that spent a cold winter with no heat in the car as a young man, best of luck with it. I had no heat in my wagon until yesterday when I happened to look down to the left of my steering column and see there was an air vent button pulled out (I have AC and the button is hidden behind the turn signal stalk when sitting in the driver's seat) Not super warm (I need to change the thermostat), but not a blast of icicles up my left leg anymore!